The hardware was HP C-Class BL680c Blades in a C7000 chassis. Fibre connectivity supplied by HP VC 4G/B Fibre Modules using NPIV. Approx 25 EVA 3000 disks were presented to each node, the HP EVA DSM was installed on the cluster nodes. Fail-over to the passive node. 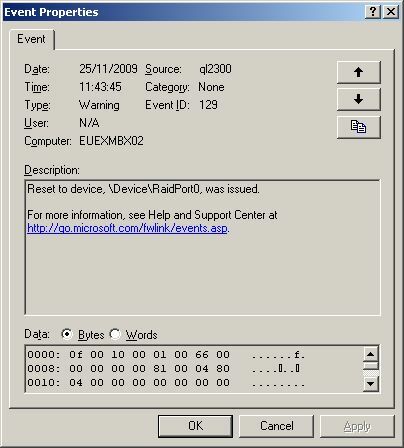 Event ID 17 : mpio Warning \Device\MPIODisk1 is currently in a degraded state. Once or more paths have failed, thoughthe process is now complete. These errors would be rported for multiple EVA disks at a time. Since following this ‘action plan’ from HP the issue wasresolved – no re-occurance in 7 weeks.